Surrounded by Rainforest and Wildlife, Kuranda is 25km north-west of Cairns in Far North Queensland. It is a great place for families to live. One of the great things about Kuranda is the fact that all the houses are unique which makes it a fantastic place to buy your dream home. Depending on the different areas around Kuranda, the properties can differ in the style of the property and the size of the land. In the Kuranda Village area, you’ll find properties that are within easy walking distance to pubs, post office, supermarket and medical centre. The land area is usually under 1 acre, and the houses range from Queenslander style to character filled workers cottages with a wooden exterior and high ceilings. Mostly fully fenced so ideal for animals. Properties within 5 minutes drive of Kuranda Village often have larger houses with 3-4 bedrooms, a pool and acreage land between 1 – 3 acres. The gardens are mostly lush green and tropical. There’s more space for sheds, garages, workshops, boat storage, or large cars. The style of homes ranges from Chris Van Dyke pole homes designed to blend with the rainforest environment, to low set, low maintenance brick. The common theme tends to be that they all have wrap around verandahs, entertainment decks or balconies. Within 5-10kms from Kuranda, it’s possible to find larger acreages ranging from 3-40 acres. These properties often have a dam, a creek or a section of the Barron River or Clohesy River in their back yard. Mountain views too. The style of the properties is very diverse as space isn’t an issue. Farmhouse style with patios, highest Queenslanders, solid brick with plenty undercover entertaining areas. Farm sheds, three bay sheds, fenced for horses. Fruit trees, veggie patches and orchards. 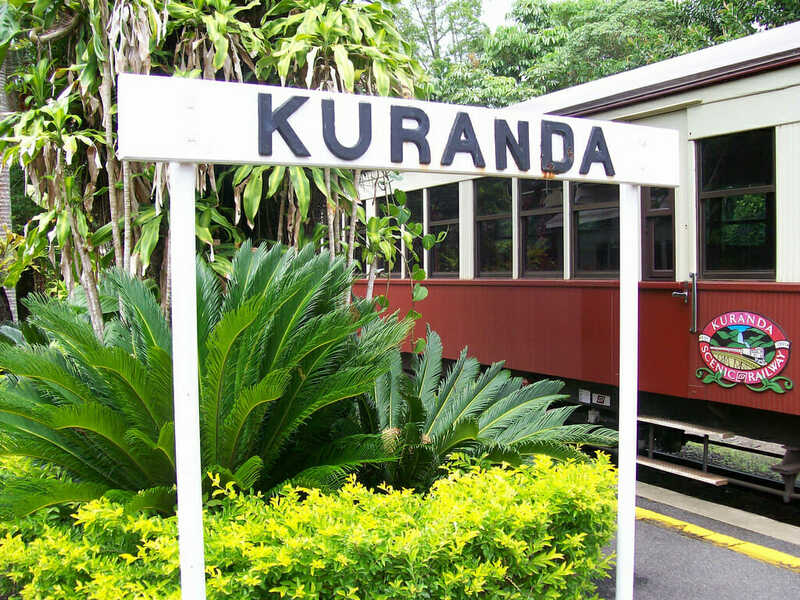 The village of Kuranda has attracted visitors, tourists and artisans for well over a century. Lots of people come to see the Barron Falls in the wet season. Its diverse wildlife inspires many kinds of artists. The welcoming atmosphere of Kuranda village is a friendly place in which to work, live or raise a family. Despite its small population (3000), the village has many services. The village has a supermarket, health clinic and several schools. Police, Fire, and Ambulance services are in the village. The village is not far from Cairns Base Hospital and Mareeba Hospital. The region has two main seasons – the wet and the dry. In winter, the days are cooler with blue skies. The Wet Season brings the rain that keeps the village looking green. Kuranda enjoys 3 to 4ºC cooler than Cairns. Sometimes, the temperature can be as much as 5ºC cooler between the bottom and the top of The Range.